NASA and a team of Brazilian space researchers have announced a joint CubeSat mission to study phenomena in Earth's upper atmosphere -- a region of charged particles called the ionosphere -- capable of disrupting communications and navigation systems on the ground and potentially impacting satellites and human explorers in space. Two phenomena in the ionosphere -- equatorial plasma bubbles and scintillation -- have impacted radio communication systems, satellite technologies and global positioning system (GPS) signals for decades, said Jim Spann, chief scientist for the Science and Technology Directorate at NASA's Marshall Space Flight Center in Huntsville, Alabama. Equatorial plasma bubbles are regions of comparatively low density which may elongate into towering plumes during high-intensity periods. Scintillation is a unique type of atmospheric fluctuation that can interrupt radio frequencies, much like the "twinkling" effect seen in starlight when optical frequencies are disrupted. The Scintillation Prediction Observations Research Task (SPORT) mission, funded by NASA's Science Mission Directorate in Washington, will observe these peculiar structures in order to understand what causes them, determine how to predict their behavior and assess ways to mitigate their effects. The joint U.S.-Brazilian team, led by Spann as principal investigator, will design and launch SPORT as a CubeSat, a compact satellite about the size of two loaves of bread. It will be launched in 2019 to an Earth orbit approximately 217-248 miles high (350-400 km). Its operational phase is expected to last at least a year. "Degraded communications and GPS signals are known to be closely linked to these phenomena," Spann said. It's his goal to shed new light on these phenomena and inspire new operational solutions to contend with the disturbed conditions. The Brazilian SPORT team seeks targeted solutions as well. Otavio Durão, project manager for the team at Instituto Nacional de Pesquisas Espaciais (INPE) in São Jose dos Campos, a São Paulo municipality, said ionospheric responses to a space phenomenon called the South Atlantic Anomaly or the South American Magnetic Anomaly -- where space radiation dips close to Earth -- negatively impacts Brazil's busy airports. "Our country is interested in refining GPS signal processing, making takeoffs and landings safer and more precise," he said. "Because so many international flights come to and through Brazil, this should be a matter of concern for all countries." Brazil's strong agricultural industry also is concerned about the anomaly's effects on GPS, said Durão's colleague Dr. Luís Loures, the SPORT spacecraft manager at the Instituto Tecnológico da Aeronáutica in São Jose dos Campos. "Our agribusiness is always trying to increase crop productivity," he said. "One way to accomplish this is by using automated tools. But being able to precisely position those automated tractors and field sprayers, without disruption from solar phenomena, is crucial." "As society becomes more dependent every day on space-based technology -- cell phones, self-driving cars, secure military communications -- it's critically important we first understand the environment in which our technology resides, then learn how to operate through and preserve it from potentially disruptive or damaging interference," Spann said. Building on decades of previous ground-based studies of plasma bubbles over equatorial regions, especially intensive research in Brazil and Peru, SPORT will help researchers determine what's happening in the ionosphere to stir up the bubbles, why they form along the equator and what causes them to appear at night. Plasma bubbles and scintillation are global equatorial and mid-latitude phenomena, made worse by the South American Magnetic Anomaly, where Earth's magnetic equator dips close to Earth. "Many of the discoveries to date have been confined to a limited number of longitudinal sectors," Spann said. "SPORT will make a systematic study of the ionosphere at all longitudes around the planet, documenting the conditions that trigger formation of the bubbles, with particular focus on the South American sector." As multiple instruments on the ground also record data, Spann said, SPORT will probe the ionosphere from above. During subsequent passes, it will study specific sectors to identify conditions favorable for developing plasma bubbles and ionospheric scintillations. These simultaneous satellite and ground-based studies will help researchers identify how the observations are related, providing a better understanding of the results at all longitudes. The team is confident the findings will enable researchers to use physics-based models to determine the physics of plasma bubble triggers, and thus identify the resulting scintillation of radio signals that propagate throughout the turbulent region. In this artist's animation, the signal beamed to Earth by a generic satellite is disrupted by phenomena in Earth's ionosphere. Regions of comparatively low density called equatorial plasma bubbles, depicted here as a shifting blue band in the upper atmosphere, combine with scintillations, atmospheric fluctuations similar to the "twinkling" effect seen in starlight when optical frequencies are disrupted, to interrupt and disperse the satellite's signal. These phenomena -- which threaten satellite communications, put human space explorers at risk and often disrupt communications and navigation systems on the ground -- are the focus of the joint NASA-Brazilian Cubesat mission known as the Scintillation Prediction Observations Research Task, or SPORT mission. Funded by NASA's Science Mission Directorate in Washington and led by NASA's Marshall Space Flight Center in Huntsville, Alabama, SPORT will be launched in 2019 for a year-long data-gathering mission. 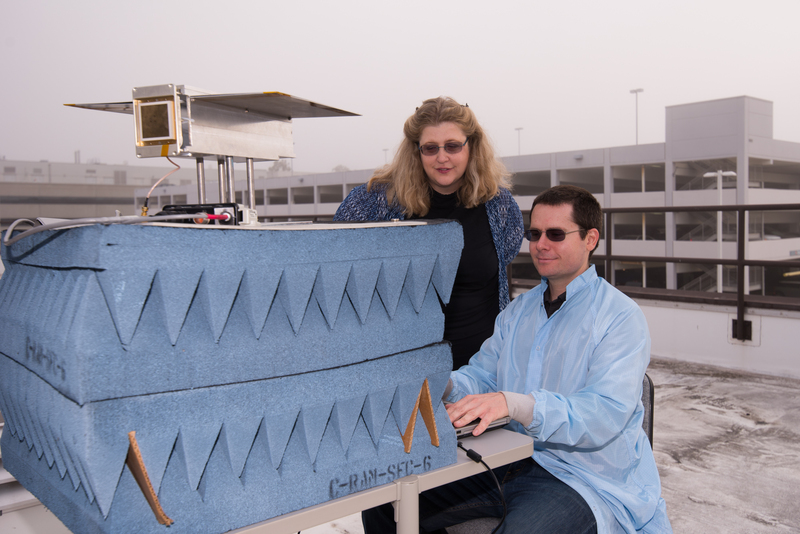 SPORT science mission data will be distributed from and archived at the EMBRACE space-weather forecasting center in Brazil's National Institute for Space Research (INPE) and mirrored at the Space Physics Data Facility at NASA's Goddard Space Flight Center in Greenbelt, Maryland. The SPORT mission management team is led by Marshall alongside its international partners, the Brazilian Space Agency in Brasília, and the National Institute for Space Research and Technical Aeronautics Institute, both in São Jose dos Campos, São Paulo. Spann's team, which oversees the mission science, flight instruments and the CubeSat launch, includes researchers at Marshall; Goddard; Utah State University in Logan, Utah; The Aerospace Corporation in El Segundo, California; the University of Texas at Dallas; and the University of Alabama in Huntsville. NASA's Brazilian partners are overseeing the development of the spacecraft; integration and testing; mission operations; data management and dissemination; and the ground observation network. The science analysis will be conducted by the entire team.